Next postIn Just 60 Seconds…. I’ve got you one better! After learning that staying with Verizon would cost about another $120 per month because of data charges, we moved to AT&T which had a great deal on both smartphones and plans. So basically, I could move all my family to an older version of the Apple iPhone (3GS) that works just fine, and pay about the same every month I pay to Verizon. Sorry, Verizon, I don’t like dropped calls, but I like paying huge upcharges for data even less. 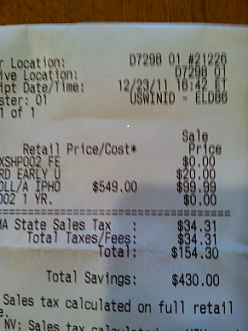 I paid about $104 for the phones and $128 to the Commonwealth of Massachusetts for tax!